Her beauty musts, which she detailed for the New York Times, certainly sound practical (a hat that's "pretty ugly, but it works" to ward off sun damage, moisturizing spray for the airplane so she doesn't "look like a prune after flying," and the same perfume she's been wearing since she was 19), but caused quite a ripple online as bloggers tallied up the price for all the items on the list — an estimated total of more than $2,000, according to New York Magazine and Racked. But she did mention one item we thought we might be able to replicate at home: "I also have a green juice that I drink every single morning," she noted. "It’s very important." 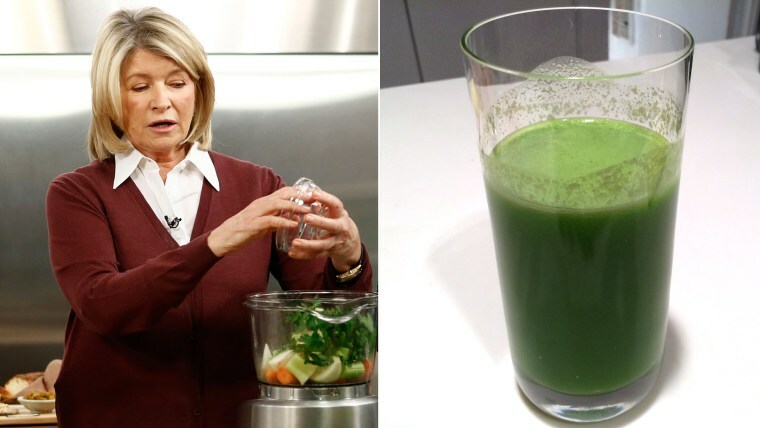 We gave it a try, and we have to hand it to Martha — the juice is delicious. Even those skeptical of the sheer volume of cucumber or the taste of parsley or celery in the morning should have no fear — we just shoved it all in, and it came out refreshing and well-balanced. Plus, the price tag is more our speed: The ingredients rang in at a reasonable total of $7.55 — including an extra 79 cents because we panicked and bought the wrong kind of pear at first, then added the Martha-recommended pear (as it turns out, it probably makes very little difference).